KIEV, Ukraine -- Ukraine's Security Service (SBU) has accused Russia of trying to influence local elections in the west of Ukraine by funding left-wing activists through secret channels. 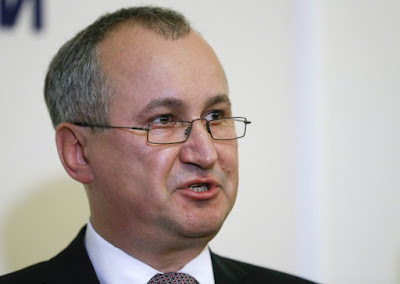 Head of the Security Service of Ukraine (SBU) Vasyl Hrytsak. The SBU issued a statement on Thursday warning Ukraine's westernmost Zakarpattia region, which borders four EU member countries, of alleged attempts by a Russian state proxy to make a deal with an unnamed left-wing party. The SBU website appeared to be down on Friday morning. "Russian Federation special services, under the guise of a private Moscow organisation, have attempted to prop up local 'lefties' with the aim of exerting influence on the situation in the region. In return the Moscow backers promised they would finance their electoral campaign," the statement read. "The SBU branch in Zakarpattia region has sent an official warning to one of the officials of the left-wing party, informing them of the unacceptable nature of of these actions, which are qualified by the Criminal Code of Ukraine as state treason," the SBU statement added. The statement did not mention what activities the party was asked to carry out in return for funding, nor which party this would be. Ukraine has many national left-wing parties, including the Social Democrats, the Communist Party and the Socialist Party, none of which have commented on the incident. The Russian government is also yet to respond to the allegation. Despite being far from the frontline in the east, the Zakarpattia region has relatively high strategic importance to Ukraine because it connects Ukraine with Slovakia, Hungary and Romania by road and also borders Poland. A serious shootout between government forces and members of Ukraine's far-right militia the Right Sector, took place in the town of Mukacheve, around 40 km (25 miles) from the Hungarian border last month. The incident wounded around 14 people and at least one man was killed. At the beginning of this month Right Sector told Russian independent news agency Interfax that the members involved in the shootout were in hiding and the organisation would not divulge their whereabouts. The members involved in the shootout are wanted on charges of "banditry." Ukraine's local council elections are due to take place in October and have not been without controversy as separatists in the eastern regions Donetsk and Luhansk have announced they will run parallel elections during the same month. Kiev has declared the separatist elections illegal. Russia's ties to political parties abroad has aroused suspicion in the past. France's far-right National Front has denied that its acceptance of a 9 million euro ($10 million) loan from a Moscow-based bank in September had any political connotations. Norbert Rottgen, who chairs Germany's Parliamentary Foreign Affairs Committee and served as minister of the environment in Chancellor Angela Merkel's cabinet, accused Putin of financing National Front leader Marine Le Pen in June and said Russia could fund eurosceptic efforts in the UK too in the run-up to Britain's referendum on EU membership. Ex-NATO secretary general Anders Fogh Rasmussen warned in April that Russia is engaging in a kind of 'hybrid war' with Europe, using "financial links" with parties in Greece, Hungary, Bulgaria and France and NGOs across Europe to skew the political agenda.